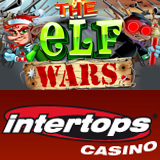 Just in time for Christmas, Intertops Casino has just launched The Elf Wars, an all new Santa vs. Reindeer slots game. The epic battle for the North Pole continues in this latest installment of the popular series that include Rudolph’s Revenge, Santa Strikes Back and Return of the Rudolph. The action intensifies in The Elf Wars as the elf factions splinter off to ally with Santa and his North-Pole guardians, or join the rebellious Rudolph and his thugs who are determined to seize control of the lucrative present-trade. In The Elf Wars’ main 50 payline slot game, Santa and Rudolph are Wilds. Three or more scattered Good Elf or Bad Elf symbols trigger a bonus feature. The Santa Strikes Back! feature gives 7 free games, where more free games are given and prize multiplier increases when symbols have a special Candy Cane background. The Rudolph's Revenge! feature also gives 7 free games, but prizes during each free game are multiplied by 2 plus the number of Rudolphs appearing on screen. If the Rudolph's Rampage! feature is triggered, players try to find the missing elves in Santa's ransacked toy factory. Plus there's a special Jackpot Spins feature that can award instant prizes.The Elf Wars has the patented Feature Guarantee system that means one of these features will be triggered within 150 spins. Intertops has been entertaining gamblers around the world for more than 15 years. The casino, poker and sports betting site is known for taking care of customers and making deposits and withdrawals easy. A festive Christmas bonus offer will be announced next week.